One of the first things that caught my eye in the new year was Sally Hansen's new Color Therapy line of polishes. I can't say Sally Hansen has done much to impress me in recent years, but this Color Therapy line has impressed me. I reviewed Steely Serene back in January. The colors in this line are not the most unique compared to indie standards, but they are some high-quality polish with excellent wear time from my experience. 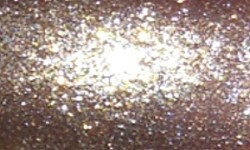 I have one of the more glitzy colors to share with you today. Therapetwer is a slightly green-tinged silver foil with sparse gold and bronze flakes. Color: This is actually a really unique color to me. I love the foil-like metallic finish and in this great silvery with just a hint of green neutral shade. It's not a flat color either there are sparse little gold and bronze flakes throughout that give this color some dimension. It's gorgeous and definitely a great go-to color when you're not sure of something to wear. Formula: This had a smooth and easy to use formula. It is sheer on the first coat but builds up opaquely and easily in 3 coats. I've worn both Steely Serene and Therapewter more than once for full manis and did get a solid 6 days of wear out of both without any chips. This line wears so well on me! Price: You can find this in the $6.70-$8.00 range at Target, Walmart, Ulta, and drugstores. Look for drugstore deals on these though! Overall: This is a beautiful and complex color. I absolutely adore it and the other colors in this line. These are really well made and have excellent long-wearing formulas. I'm really impressed and plan to add more of these to my collection.